Mi Quang means “noodle from the Quang Nam province” and this is a countryside delicacy. We say that Cao Lau is the Hoi An city treat, Mi Quang is the country treat. Contrasts also abound in this wonderful dish of noodles, shrimp, pork, rice crackers, peanuts and herbs! Heat oil in small stockpot. Add garlic and spring onion, cook 1 minute to release flavours. Add shrimp and pork, cook 3-4 minutes. Add tomato sauce, fish sauce, pineapple, pumpkin, salt, pepper, chilli oil and sugar. Cook 3-4 minutes. Add stock and crabmeat and simmer 10 minutes. Turn off heat.Blanch bean sprouts in boiling water for 30 seconds then add noodles for a further 30 seconds. Strain well. 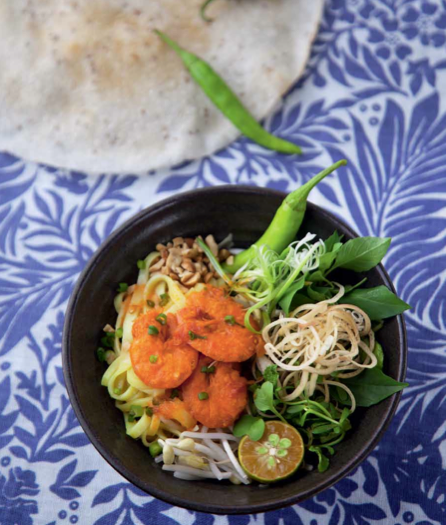 Serve in 4 bowls with 2 ladles of the shrimp and pork mix on top, arrange herbs on the edge of the bowl so they stay fresh and crunchy, crush half of the rice paper and sprinkle over the top, garnish with peanuts, spring onion curls, a slice of chilli and half a cumquat. Serve with fish sauce and rice crackers on the side.